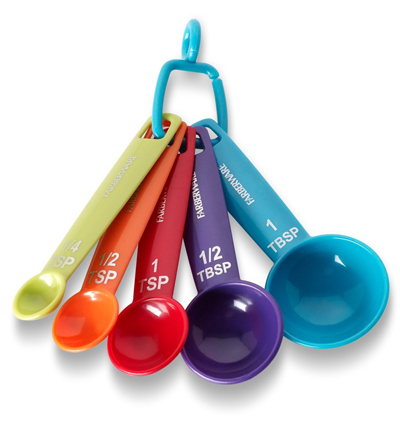 These Farberware Color Measuring Spoons feature easy to read measure markings and bright colors that make them easy to find in a drawer. Dishwasher safe. $5.99. Buy here. 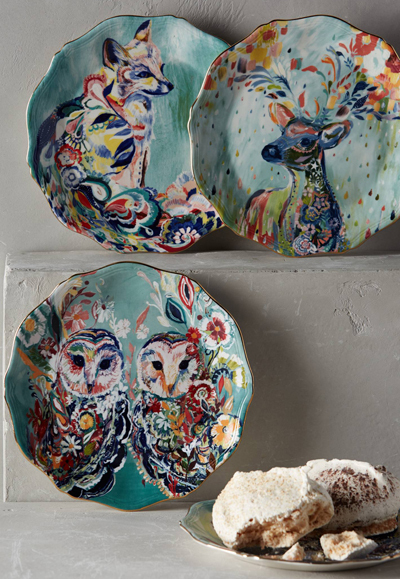 From the animals on her childhood farm to the wildlife on the forested trails around her Austin home, Starla Michelle Halfmann has loved the natural world her entire life – a passion that’s evident in every vivid brushstroke on this Mooreland Dessert Plate. Made of new bone china. Matching serveware, pitcher and home decor also available. $16. Buy here. 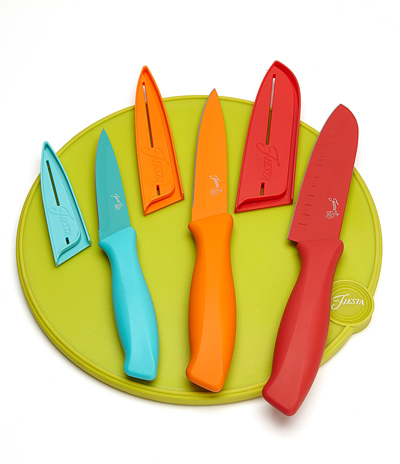 This Fiesta 7-Piece Cutlery with Board Set features high-gauge steel blades with a ceramic color coating that matches the handle color, ergonomic handles made from an ABS core with a soft-feel grip for comfort and a 10″ round polypropylene cutting board with silicone non-slip edge for safety. $29.99. Buy here. 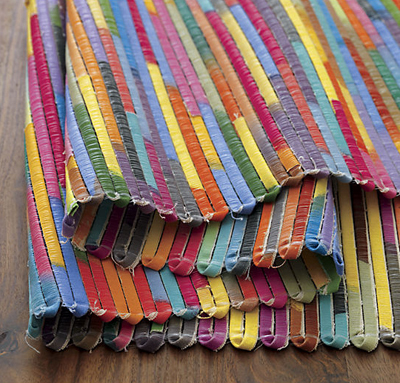 Handwoven from strips of canvas, this colorful Anu Table Runner weaves a story of optimism. In an intricate, time-intensive process, New Delhi artisans bring blank cotton canvas to life, handpainting bold strokes with eco-friendly paint in a bright spectrum that spans the rainbow. The canvas is then cut into strips, folded and woven together on a traditional handloom in a pattern unique to each runner. $59.95. Buy here. 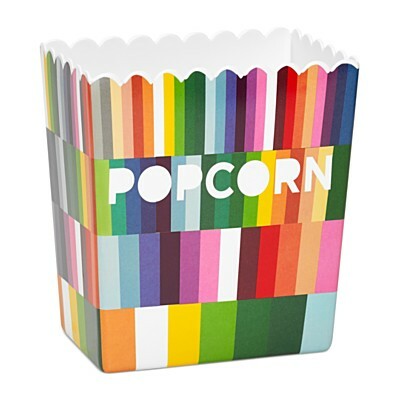 Add a dash of irreverence to your movie night with the colorful, cutting-edge Novogratz Collection Melamine Popcorn Bowl. Scalloped edges imitate the rim of a traditional popcorn bag while bold typography and color make snacking extra fun. $12. Buy here. 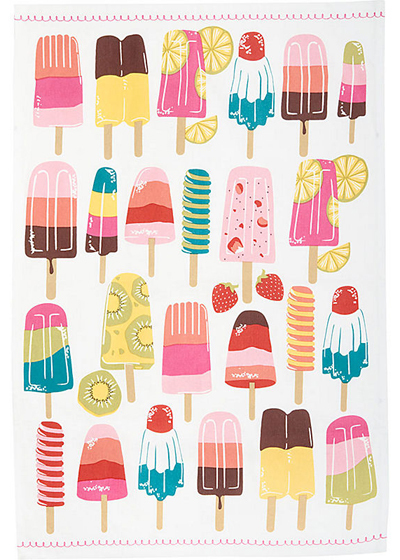 These colorful Ice Pop Tea Towels feature ice pop artwork printed on 100% cotton towels. 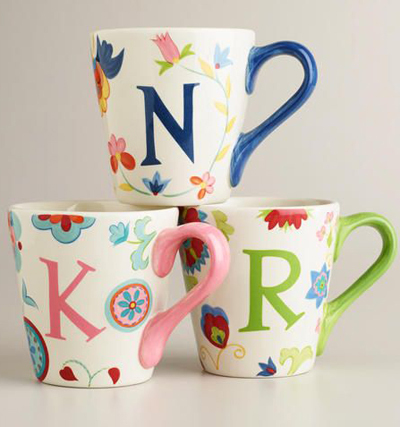 A cool, summery accent and a wonderful gift for your favorite hostess. Set of 3. $16.95 Sale $11.87. Buy here. From Fiesta, this 5-Piece Bamboo & Silicone Utensil Set is made from renewable bamboo and features silicone, non-slip handles and heads. Multiple shapes, sizes and material options for convenience and versatility in the kitchen. Durable silicone is heat resistant up to 550 degrees Fahrenheit. $29.99. Buy here. 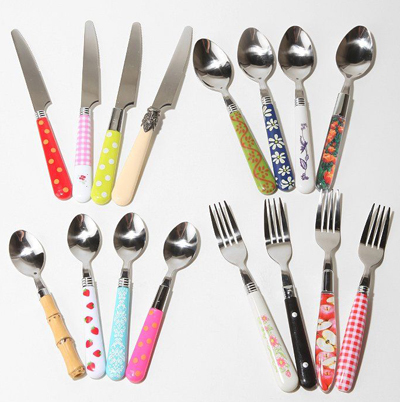 Add a touch of retro chic to your table with this funky Mix and Match Cutlery. 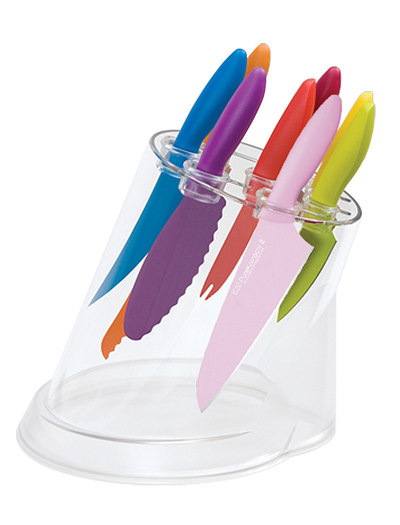 Featuring sturdy stainless steel with varying designs on the plastic handles. Set of 16 includes 4 forks, knives, teaspoons and dessert spoons. Dishwasher safe. $39. Buy here. 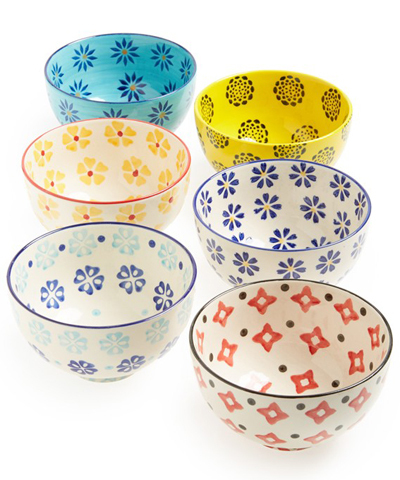 An eclectic assortment of prints and colors styles this set of six footed Global Bowls with a bright and cheery aesthetic. Set of 6. $36. Free shipping. Buy here. 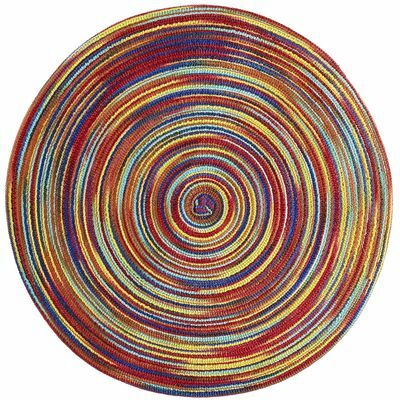 This Color Wheel Placemat will add every other color to the meal. Another option? 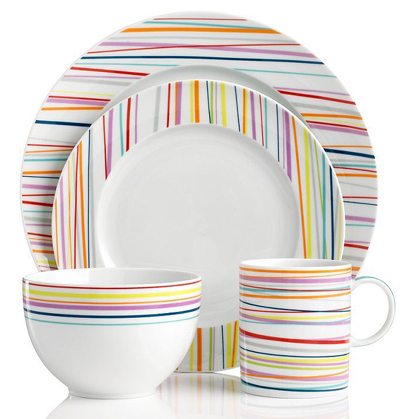 Let it pull everything together when you want to bring out the mismatched plates and linens. It really is a brilliant little placemat. $3.95. Buy here. Brighten up your kitchen with the Shun Pure Komachi 2 Series 9-Piece Block Set featuring eight of our most-wanted pieces of kitchen cutler plus an acrylic block to show them off. $99.95. Buy here. 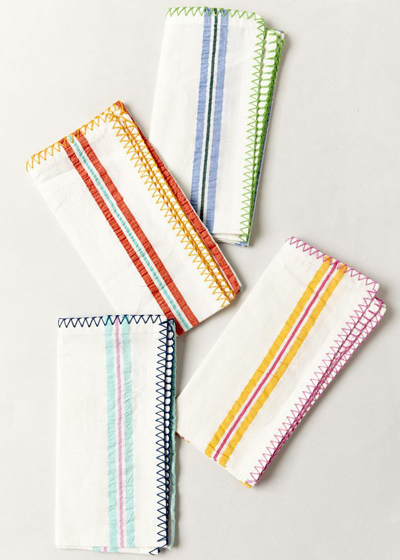 These breezy cotton Whitley Napkins add a pop of color to any dining table. Set of 4. $32. Buy here. 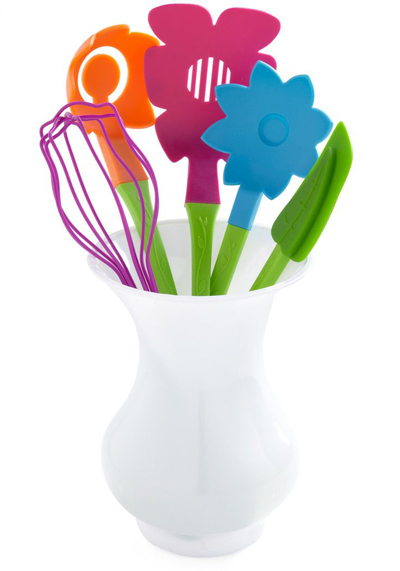 This Fresh Skills Cooking Utensil Set by Decor Craft Inc. features a polished, white plastic vase filled with a spoon, spatula, slotted spoon, whisk and petal-trimmed turner. Each utensil has a lime-colored handle adorned with a leafy pattern and finished with a petite hole for hanging. $37.99. Buy here. 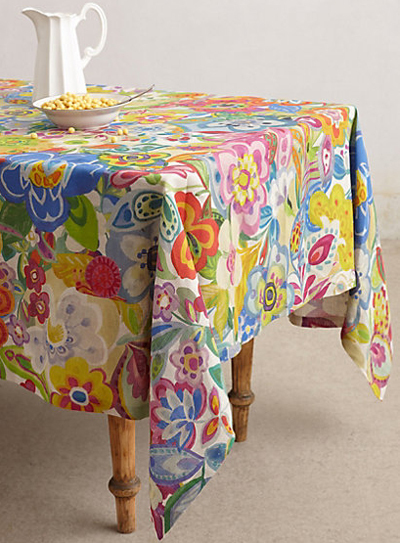 The Cimbrone Tablecloth instantly sets the scene for spring with its medley of vibrant hues. Made of linen. $128. Buy here. 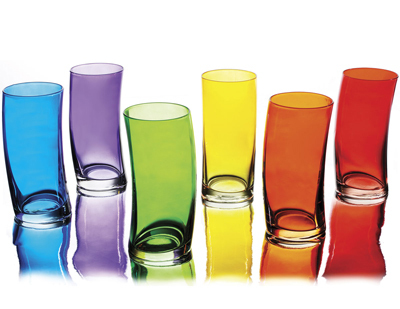 These adorable Milk Bottle Measuring Cups stack together to make a cute countertop display. $24. Buy here. 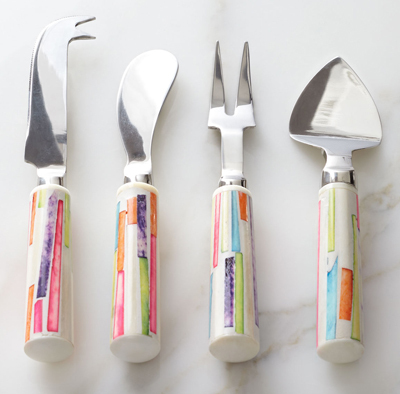 Create a party atmosphere anytime you like with this multicolored Liberty Cheese Knife Set. Bone handles with stainless steel implements. Four-piece set. $55. Free shipping. Buy here. 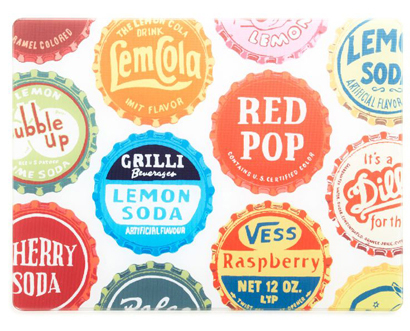 A colorful worktop covered in cola caps, this Soda They Say Cutting Board is perfect for chopping, serving, and protecting your counter from freshly baked casseroles. $29.99. Buy here.